What sparked my interest in this book was a number of things. 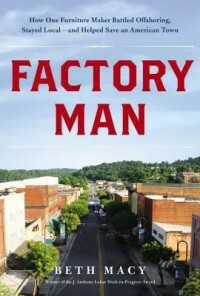 One being that I lived in Martinsville Virginia for a few years (around where the story takes place) and that I have a fascination of how so many American companies choose cheap furniture made oversees in order to fill their pockets full of more money. I just can't imagine putting my name on something of such low quality just to have that extra summer home that I would only visit once in a while. I had no idea, shame on me, that John Bassett III of Bassett Furniture Company took on China... and won! I, for probably the first time, was proud to say that I once lived in an area where a company actually cared about saving hundreds of jobs and keeping the quality that the furniture deserves. What impressed me most about John Bassett III was that doing something this daring comes at a cost. Since so many companies are offshoring their businesses, this made many of his colleagues and competitors very angry. Not only that, but he lost a lot of business due to companies not carrying his furniture because of this. It was so refreshing to see someone not give into the pressures of others and sacrifice his own money for the welfare of his employees. Bravo to the author for her great research and a definite bravo for John Bassett III. Stories such as these are rare, but I hope that he has laid down a foundation for other companies to come.